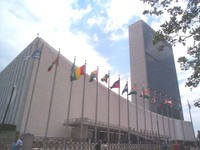 U.N. Secretary General Ban Ki Moon has appointed Michael Adlerstein of the United States as executive director of the Capital Master Plan -- the $1.9 billion renovation project of the organization's New York headquarter complex, according to a spokesperson for the U.N. chief. "The appointment will enable the United Nations to move forward with the implementation phase of the Capital Master Plan," a statement said, adding the renovation will take place over the next seven years. Most recently, Adlerstein was the vice president and architect of the New York Botanical Garden. In addition, Alderstein oversaw the restoration of Ellis Island and the Statue of Liberty. Born in New York in October 1945, Adlerstein also served as a Peace Corps volunteer in Colombia, and has worked as a State Department consultant on preservation issues on numerous projects, including the preservation of the Taj Mahal, the statement said. Read more. Read more about Peace Corps Architects. Read more about Peace Corps Colombia.